3-in-1 kit makes a Stegosaurus (our favorite), a T-Rex, and a Pterodactyl, each taking about 2 hours to complete. Greetings! We’re still working on making sure we’ve gathered up all the possible information you need to make your toy decision. We want to be thorough, after all. Thanks for looking us up, and we hope to see you back again! This 3-in-1 model kit creates three different dinosaurs, each with light up eyes. Each dino is mostly green in color, with gray, brown, and yellow highlights. Use the detailed illustrative instructions to piece together one of the mighty models. Put it on display, take it along on adventures, or take it apart and do it all over again. 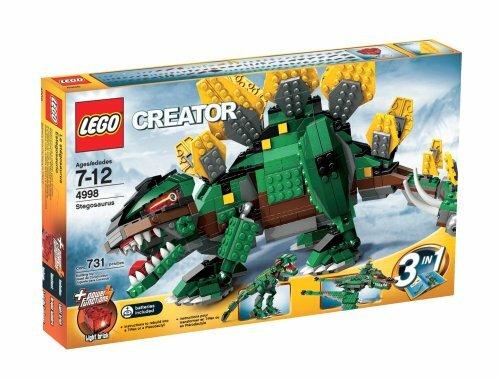 With large sized models and functional yet sturdy moving parts, these dinosaurs are great to build and durable enough to play with afterward. Though the box doesn’t say so, the eyes also glow in the dark. Due to the specificity of the instructions and the need to follow them precisely, toys like this are helpful tools in teaching children the importance of thinking ahead. Additionally, fitting the small pieces together challenges fine motor skills. Each model takes a decent amount of time to complete, with about 2 or so hours as the average. Children 7 and up can usually handle the instructions on their own, but may need an adult’s help every now and then. We haven’t heard of a single adult complaining about this. In fact, most adults we talked to are usually pretty excited about getting to help out. 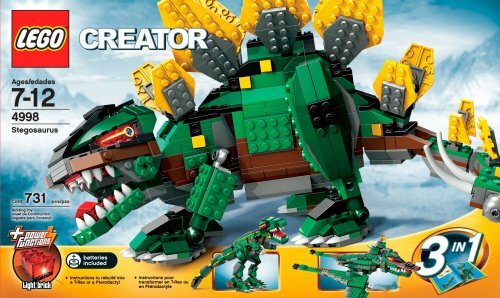 Speaking of adults and LEGOs, we know this kit has been also been a hit with LEGO and dino enthusiasts in general, regardless of age. We’ve thought about getting one as a birthday gift for one of our writers, and she’s turning 30. There have been a few reports of pieces not fitting as tightly as one might like. 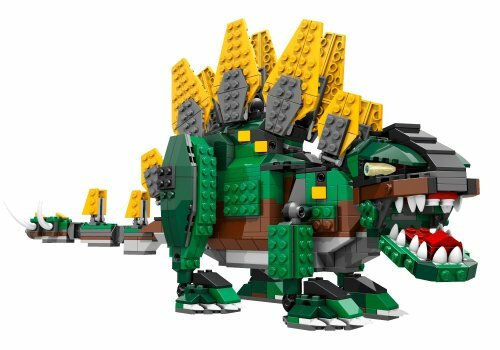 For instance, the back legs on the Stegosaur may pop off if it’s played with too roughly. Most users didn’t have this problem. We recommend making sure that the dinosaur glides across the floor rather than actually trying to go through the walking motion, which can cause unnecessary jarring to the back legs as they hit the floor. Overall, a pretty cool kit with hours of play. For more detailed information on how to wash plastic toys, please see our blog, The Cleaning Guide for Toys. In the case of a lost or missing piece, use this page to contact the manufacturer. As with most LEGOs, the pieces in this kit can fit with other pieces of the brand. However, we recommend keeping these separate since trying to sort them out later may be frustrating. Don’t step on the pieces. It hurts. So much more than it should. Here comes the plate-backed Stegosaurus! This Jurassic dinosaur may have eaten plants, but it was no pushover... just check out the four long spikes on its lashing tail. The Stegosaurus is fully articulated with eyes that really light up. Includes instructions for rebuilding into a hungry T-Rex or a soaring Pterodactyl. Features movable mouth, tail, head and body and comes with a light-up brick. Batteries included. Measures 17"L x 8"H. 731 pieces.